My earliest memories of purchasing records from Sam Sniderman’s store date from 1958-1959. I lived in the west end of the city, but was working in the British American Oil Company building at Bay and College Streets. I was collecting 78 rpm recordings of brass bands, particularly those in Great Britain. Sam’s was one of the few shops that stocked these disks, as they were not exactly mainstream merchandise. On my way home from work, I sometimes boarded a westbound College Street streetcar and travelled to Sam’s store at 714 College Street, three blocks east of Ossington Avenue. The store was rather jumbled and slightly run down, but the record collection was fantastic. The store on College Street that I visited was named, “Sniderman Radio Sales and Service.” It had been established by Sam Sniderman’s father in 1929. In 1937, Sam began selling records in his father’s store. After long-playing vinyl disks were introduced in 1948, record sales expanded greatly, and by the late 1950s, Sam’s store had one of the largest collections of recordings in the world. Its main competitor was A&A Records on Yonge Street. Sam Sniderman realized that to truly be able to compete with A&A, he required a downtown location. As a result, in 1959, he rented space on the ground floor of Yolles Furniture Store at 291 Yonge Street, on the west side of the street, south of Dundas Street. However, he did not remain on the site very long. In 1961, Sam relocated his business to 347 Yonge Street, two doors south of A&A Records. The signage on the front of the store displayed an huge thermometer and barometer, the colour red dominating the display. Sam’s was in the heart of the movie theatre district, where foot-traffic was constant all day and continued into the late evening hours. People who attended the large theatres such as the Imperial or Loew’s Downtown, and those who visited the smaller Biltmore, Savoy or Downtown Theatres, often dropped into Sam’s or A&A’s before journeying home. The shops remained open until midnight, the late-evening hours being the busiest. In 1967, annual sales at Sam’s topped $2 million, the equivalent of about $15 million today. The year 1969 was an historic year in the history of the store, and is one of the reasons that Sam’s is so well remembered today. Wishing to attract more attention to his enterprise, he hired the best-known sign company in the city – Brothers Markle. It created the iconic sign that became a favourite of many Torontonians. Requiring two months to complete, the neon vinyl sign resembled a huge record disk, approximately 7 metres by 5 metres. The neon tubes flashed on and off, creating the effect that the record was spinning on a turntable. When Sam took over the building to the north of his store, the signage was extended to include another flashing record disk. This brought the total size of the sign to 15 metres by 10 metres. It was visible to everyone who nightly strolled “the strip,” as that section of Yonge Street was known. The brightly-lit sign became an integral part of the scene. During the 1970s and 1980s the record business was flooded with sales, and Sam’s rode the crest of the wave. The store’s brand was franchised throughout Canada; at the height of the popularity of LP records, there were 130 outlets. Sam encouraged vocal artists to perform in his store on Yonge Street, and through these events he promoted the careers of artists such as Stompin’ Tom Connors, Gordon Lightfoot, Anne Murray, Guess Who, and Joni Mitchell. Sam continually expanded, occupying the bank building on the corner on the northeast corner of Yonge and Gould, to the south of his store. However, during the 1990s, sales began to diminish. Sam’s went bankrupt in 2001, but was resurrected in 2002 by his two sons—Bobby and Jason. However, they were unsuccessful in restoring the business as even CD sales were dropping due to the internet. The store permanently closed in in February 2007. Ryerson University purchased Sam’s and A&A, along with others buildings in the same block. They were demolished to create the Ryerson Student Learning Centre, with the understanding that the iconic Sam’s sign would be resurrected and placed on the new building, since it was designated an historic artefact under the Ontario Heritage Act. It was never installed, as the university claimed that the sign did not suit the modern style of their new structure. However, I sometimes wonder if the condition in the purchase agreement was truly impressed on the architect. It now appears that the university is planning to place the sign above a city-owned building that overlooks Yonge/Dundas Square. Viewed from atop a tall building, its impact would be non-existent, especially with the enormous number of signs that overlook Dundas Square. Sam died in September 2012 at age 94. He made a wonderful contribution to the life of Toronto and is fondly remembered for much more than the neon sign he left behind. View looking south at the east side of Yonge Street. The Edison Hotel is visible on the southeast corner of Yonge and Gould Streets. It was demolished after its north facade collapsed into the street. Toronto Archives, F124, fl 0003, id 0197. Sam the Record Man on December 30, 2007, after it closed for the final time. A&A’s had already disappeared. Photo from Urban Toronto, by Edward Skira. Gazing west toward Yonge Street at the former site of A&A and Sam’s, the construction of the Ryerson Student learning Centre in progress. The low-rise buildings in the background are on the west side of Yonge Street. The Ryerson Student Learning Centre on the east side of Yonge Street, north of Gould Street, in 2015. It is where A&A and Sam’s once stood. Personally, I believe that it is architecturally magnificent, but is not appropriate for this section of Yonge Street. It overpowers the historic buildings in the neighbourhood and aesthetically does not fit into the area. In another location, this structure would be an architectural icon. Below is another viewpoint on the new Ryerson Student Learning Centre, written by Luis Fernandes. I agree in principle with your sentiments. Some time in the future, the citizens of Toronto will regret demolishing those buildings. However let me provide an alternative point of view to the situation– I have to mention that I have been working at Ryerson for 20 years, after having graduated with a degree– and what follows is insider information, so to speak. Whenever anyone asked for directions to Ryerson, instead of telling them the street intersection it was on, the most accurate answer was to say, “It’s behind Sam the Record Man”– because everyone knew where Sam’s was. I often gave this direction when asked. When Sheldon Levy become president of Ryerson, he found out about this “direction” and made it his mission to change this “2nd-class perception” of Ryerson’s place by giving the University a more prominent footprint on Yonge Street. As a result, people no longer ask for directions to Ryerson anymore. It’s a shame that so much history had to be traded for this recognition. Another book, published by Dundurn Press, containing 80 of Toronto’s former movie theatres will be released in May, 2016. 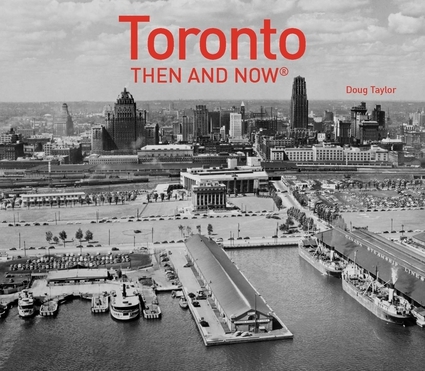 It is entitled, “Toronto’s Movie Theatres of Yesteryear—Brought Back to Thrill You Again.” It contains over 125 archival photographs and relates interesting anecdotes about these grand old theatres and their fascinating histories. The Biltmore Theatre on Yonge, north of Dundas St.
Birchcliff Theatre on Kingston Rd. Bloordale Theatre (the State) on Bloor St. West, near Dundas Street. College Theatre at College St. and Dovercourt Rd. Garden Theatre at 290 College Street. Glendale Theatre on Avenue Rd. Hillcrest Theatre on Christie Street, south of Dupont St.
Hollywood Theatre on the east side of Yonge Street, north of St. Clair Avenue. Major St. Clair Theatre on St. Clair Avenue, east of Old Weston Road. Nortown Theatre on Eglinton, west of Bathurst St.
Paramount Theatre on St. Clair West, between Oakwood and Dufferin streets. Radio City Theatre on Bathurst, south of St. Clair. Royal George Theatre on St. Clair W., west of Dufferin Street. Royal Theatre (the Pylon) on College St.
University Theatre on Bloor St., west of Bay Street. York Theatre on Yonge near Bloor St. The Princess Theatre on November 18, 1930. City of Toronto Archives, Salmon Collection, Series 1278 File 136. In 1880, a grand theatre opened in Toronto at 167 King Street West. Its original name was the Academy of Music, but it was changed to the more regal title of Princess. Located on the south side of King Street West, it was between Simcoe and York Streets. The row of buildings that included the theatre no longer exists as it was demolished when University Avenue was extended south from Queen Street. Thus, the site today is buried beneath the multi-lane University Avenue. The theatre’s opening was an historic event, as it was first theatre in Toronto of any size that offered live theatre. No one knew that the opening of the Princess was the beginning of Toronto’s rise to become the third most important English-speaking theatre centre in the world. The theatre was amazing for its day. It was the first public building in Toronto to be electrified, following the lead of the Savoy Theatre in London, England, the first building in that city to be electrified. Mary Pickford, whose real name was Gladys Smith, gave her first stage performance at the Princess in 1900, in the play “The Silver King.” Her mother needed money and allowed her daughter to audition for the part. Mary Pickford loved the experience and eventually became the greatest film star of her day, the first international star of the silver screen. In 1907, the city’s first performance of the opera “Madame Butterfly” was at the Princess, just three years after its Milan debut. The same year, another theatre opened on King Street, offering live theatre in competition with the Princess. This was the Royal Alexandra Theatre, which remains in existence today. In 1915, fire destroyed much of the Princess Theatre. It required two years to repair the damage and reopened in 1917 as the New Princess Theatre. In November 1924, the film “Thief of Bagdad” premiered at the Princess, starring Douglas Fairbanks, the husband of Mary Pickford. It was a silent film and for the occasion the theatre hired a 20-piece orchestra to provide the background music. It was a gala performance, since the theatre rarely showed films, as it specialized in live theatre. However, because this one of the most important movies of the decade, the theatre allowed an exception. After almost four decades as one of Toronto’s most popular theatres, it finally shuttered its doors. The theatre was demolished in 1931. Programs from the Princess Theatre, Ontario Archives. I am indebted to www.world theatres.com, silenttoronto.com, and Man in the green goggles journals.hil.unb.ca for some of the information contained in this post. The Prince of Wales Theatre was located at 2094 Danforth Avenue, on the north side of the street, near Woodbine Avenue. Today, the Woodbine subway station is nearby. The theatre opened on May 5, 1924, six years after the Prince Edward Viaduct was completed across the Don Valley. On its brick facade were several narrow horizontal bands of stone, which gave the building a degree of individuality that differentiated it from the structures on either side of it. The theatre possessed a heavy cornice that contained a row of dentils beneath it. Above the cornice was a parapet that created the illusion of extra height. On the second storey were residential apartments, their rental income helping to defray the operating expenses. The theatre’s auditorium contained 1250 seats. There is very little information on the theatre in the archives, but it likely possessed a stage and an area to accommodate musicians, since it was built in an era when theatres featured vaudeville acts along with the silent films. Both of these forms of entertainment required music. The film advertised on the marquee of the 1927 photo of the Prince of Wales is “An Affair of the Follies,” released in February 1927, directed by Millard Webb, starring Billie Dove. This movie is one of many films from the era of silent films that has been lost. The fact that the film was being shown at the Prince of Wales the same year it was released illustrates that the theatre was showing recent films in direct completion with the larger theatres on Danforth Avenue. The theatre shut its doors in 1966, but the building remains today though it has been altered to accommodate other commercial enterprises. Note: The author is grateful to cinematreasures.org for the information about the opening and closing dates of the Prince of Wales Theatre. The site of the Prince of Wales after the theatre was demolished. Photo, Toronto Archives. I remember when the site of the Bell Lightbox, the headquarters of the Toronto International Film Festival (TIFF), was a parking lot. I also recall the excitement that occurred when they announced that a permanent home for the festival was to be built, designed by the architectural firm of Kuwbara Payne McKenna Blumberg (KPMB). Until it was completed, the festival’s offices were to remain in several different buildings in the downtown area. The new headquarters would allow TIFF’s support facilities to be located in a single structure. Another difficulty, prior to the construction of the new building, was that the screening venues for the festival were scattered from Bloor Street in the north to King Street in the south. Since the new headquarters was to be located in the heart of the city’s Entertainment District, it was hoped that the festival’s screening venues would eventually cluster around it. This did indeed occur. After construction began, I anxiously watched the storeys rise, one after the other. Located at 350 King Street West, on Reitman Square, on the northwest corner of John and King Streets, it soon towered to a height of 46 floors. The name “Bell Lightbox” seemed appropriate, since Bell Corporation was a major financial contributor, and the word “lightbox” was an early-day name for a camera. The building opened on September 12, 2010, the 35th year since the inauguration of the festival, with a massive street party on King Street. Featuring live performers and concerts, it was a gala that lit the night until the early-morning hours. The TIFF Lightbox occupies the five-storey podium of the 46-storey tower, its entire space dedicated to film—screening, archival, and educational. Above the Lightbox is a hotel/condo complex named the Festival Tower, set back from the street, with a separate entrance at 80 John Street. When sales commenced for the condos, rumours spread in the press and on the internet that Hollywood stars were purchasing condo units in the tower to provide accommodations and entertainment suites during the festival. However, the identity of the stars was kept a secret. These stories added to the mystery and glamour surrounding the building. The TIFF Lightbox contains five cinemas, three studios, two restaurants, the Film Reference Library, a gift shop, two art galleries, a licensed lounge and a museum-quality display gallery. The members’ lounge is on the second floor, on the southeast corner of the building, with panoramic views of the street below where colourful streetcars ramble along the crowded avenue. The lobby is the equivalent of three storeys in height. An exceedingly tall escalator ascends from the lobby to the second floor. The south facade of the podium contains sheets of glass that during the day reflect the ever-changing panorama of historic King Street, and at night, its interior lights illuminate the streetscape like a giant beacon. The theatres in the complex are among the most comfortable in the city. The rows are steeply-sloped to create stadium seating, ensuring that each seat possesses an unobstructed view of the screen. The Lightbox owns five types of 35 mm cameras, as well as one that is 70 mm. I toured the building after it opened in 2010 and enjoyed the experience. However, I must admit that I had never attended the festival itself. I had resisted because I did not enjoy line-ups and did not wish to sit in a darkened theatre on a sunny late-summer day. However, in 2011, a friend had an extra ticket for a screening of a South Asian film at TIFF and offered it to me. I attended and thoroughly enjoyed the experience, particularly the discussion with the stars of the film following the screening. The next day, I purchased tickets to view a movie at the Elgin, and on arrival at the theatre, my friends and I were dismayed at the length of the line-up. However, when the doors opened, the lines entered within minutes. The organizational skills of the volunteers were amazing. My resistance to attending TIFF crumbled. I purchased a membership that I intended to use the following year. Each year since, I have faithfully attended TIFF, and now consider it one of the highlights of my year. Several weeks prior to the festival, I purchase a package and choose the films I wish to see. I tend to avoid the popular Hollywood films as they will arrive in the regular theatres at some point following the festival. Instead, I concentrate on foreign movies and films that I might otherwise never have an opportunity to see. I choose mainly evening performances to enable me to continue enjoying September’s late-summer days. This approach works well for me, though it would not be everyone’s approach to choosing movies. I consider attending TIFF a wonderful experience. I am hooked. The atmosphere on King Street during the festival is amazing. It’s wild, a kaleidoscope of colour and motion. While attending the various screenings, I have enjoyed conversations with strangers during the short waiting times before the theatre doors open. Inside the theatres, while waiting for the movies to begin, invariably people chat with me and share their opinions about films they have seen. My visits to the Bell Lightbox are not restricted to when TIFF is in operation. I attend films there throughout the year. Viewing movies there is akin to attending a live theatrical performance, whether it is a movie classic from yesteryear, a foreign film, a recent Hollywood release or an art film. One evening I went to see a film about the painter Tom Thomson and was surprised to see that the theatre was full. It was gratifying to realize how much interest the famous artist generated. On another occasion I viewed “2001 Space Odyssey,” viewing it as it was intended, with a 70 mm projector and Dolby sound. Another night a group of us saw the 1979-film “Love at First Bite.” The movie was corny and delightfully campy. Great fun! After the movie, the star of the film, George Hamilton, appeared and answered questions. The same group of friends also saw “Jaws,” and after viewing it on the big screen, we rediscovered what a terrifying film it was. The Bell Lightbox has become a regular haunt for my friends and me as it offers a wide range of films and experiences 365 days a year. The Bell Lightbox is now an integral part of the Toronto scene. It participates in various events of the city. During the summer of 2012, the City of Toronto placed second-hand pianos throughout the downtown area and encouraged people to perform on them. Artists decorated the pianos, each one representing a country that would be participating in the 2015 Pan Am Games. The piano representing Costa Rica was in the lobby of the Bell Lightbox. Toronto is greatly enriched by the presence of the Bell Lightbox, home to one of the world’s greatest film festivals. The TIFF Lightbox and the Festival Tower Hotel/Condo above it during the summer of 2012. View gazes west on King Street. Lobby of the Bell Lightbox during TIFF 2013, the red carpet visible. The Royal Theatre at 608-610 College Street, near Clinton Avenue, is in the heart of Little Italy, although the area also has a substantial Portuguese community as well. When the Royal opened in October in 1939, it was named the Pylon, and was located in a community that was predominately British. The choice of the name Pylon is unknown, but in ancient Egypt it was the name given to the entrance of a grand temple. Perhaps the owner of the Pylon Theatre wished to portray that when people attended the theatre, they were in a place of significance. The builder of the theatre was a woman named Ray Lewis. She was determined to create a venue that would truly be the entertainment centre of the community. To accomplish this aim, she included a roller-skating rink at the rear of the theatre and a dance hall on the second floor. Ray Lewis was born Rae Levinsky, in Toronto in 1883. She was the editor-in-chief of the “Canadian Moving Picture Digest,” and eventually became its owner. Ray Lewis was influential in the Toronto theatre scene in an era when it was not common for a woman to engage directly in owning and managing a company. During the 1940s, the theatre held matinees for children, pioneering the idea of encouraging adults to attend, though they were seated in a separate section of the auditorium. The management claimed the idea worked well, although I find this difficult to believe. However, there is no doubt about the success of the theatre’s children’s parties, held for Jewish and Roman Catholic organizations. In the evenings, during this decade, amateur talent nights were offered as well as short-subject films. The name of the theatre was changed from the Pylon to the Royal at some time after the old Royal Theatre at Dundas and Dufferin closed. In the late 1950s and 1960s, the demographics of the neighbourhood surrounding the theatre changed. The owner of the Bar Cafe Diplomatico on College Street, Rocco Mastrangelo, purchased the theatre. He also bought the St. Clair Theatre and showed Italian films at both venues. Interestingly, the Bar Cafe Diplimatico survives to this day (2014). In the 1990s, the theatre was renamed the Golden Princess and screened Asian films. The theatre eventually became part of the Festival chain of theatres and reverted to its original name, the Royal. In 2006 the chain folded and the theatre became independently owned. Today, it is an integral part of the scene in Little Italy, screening recent films, second-run features, and independent art films. During the day, it is rented for studio and rehearsal space. The Royal (Pylon) c. 1940, when it screened Hollywood films. Photo, City of Toronto Archives, M. Sprachman Collection. The Pylon Theatre on College Street, with its original marquee and signage. Photo, City of Toronto Archives, M. Sprachman Collection. The old Royal Theatre at Dundas and Dufferin Streets. The Pylon adopted its name after it closed. The Royal Theatre on College Street during the summer of 2013.